Tucson is a vibrant, culturally interesting city set in a desert valley surrounded by four mountain ranges. Visitors have a plethora of choices in accommodations. Guest ranches offer uniquely Western experiences, spa resorts provide serene desert luxury, and golf and tennis resorts satisfy active travelers. It is the charming, and often historic, bed and breakfasts though that dominate the hotel scene in Tucson. 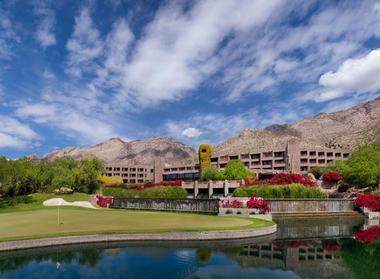 With nearly 40,000 square feet of outdoor space, including two Tom Fazio-designed golf courses and the Lakeside Spa, the Loews Ventana Canyon Resort is a generously sized resort that doesn’t sacrifice intimacy. Located at the bottom of the Santa Catalina Mountains, near the Santa Cruz River, the resort features an outdoor swimming pool with a mountainous backdrop. Traveling with a pet can be a challenge but the resort makes it easy with amenities for your pup. Along with offering dog-walking services, the resort also features specialized bedding and a gourmet menu just for your dog. 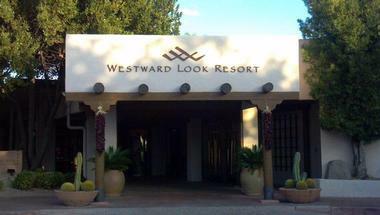 The JW Marriott Tucson Starr Pass Resort & Spa is a great option for guests who want to spend their vacation outdoors. With three separate Arnold Palmer golf courses, many guests opt to spend their time on the links. For guests who aren’t experienced in golf, lessons are offered. Nearby hiking trails lead through the natural desert landscape. 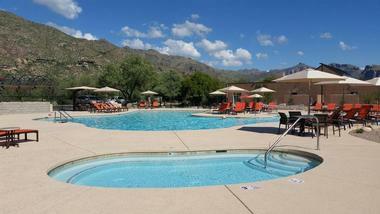 With multi-level pools and a lazy river, the resort is also a great place to enjoy the warm Arizona sunshine. After a day of fun activities outdoors, guests can relax in one of the patio dining options located on the resort. 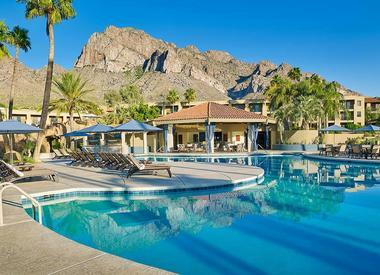 Guests yearning for the ultimate relaxing vacation will find their Shangri-La at The Westin La Paloma Resort & Spa. With deep soaking tubs and private balconies in every room, the resort caters to those who value tranquility and luxury. The Red Door Salon & Spa is the perfect oasis. It features a bevy of holistic services dedicated to de-stressing guests. With 18 private treatment rooms and an outdoor space, the spa can accommodate a range of guests, from those seeking anti-aging facials to bridal parties looking to prep for the big day. The resort also features a wide variety of restaurant options, including an espresso café and a swim-up bar. White Stallion Ranch is a true dude ranch experience on the True family ranch that has been in operation for over 50 years. This award-winning ranch is a traditional dude ranch with guest-centric hospitality and personalized attention. 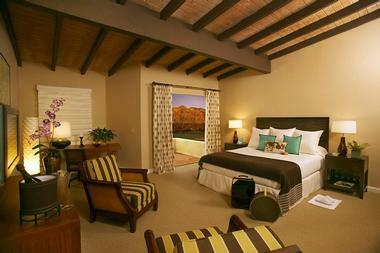 There are 43 renovated guestrooms and suites and a four-bedroom private hacienda for small groups or large families. 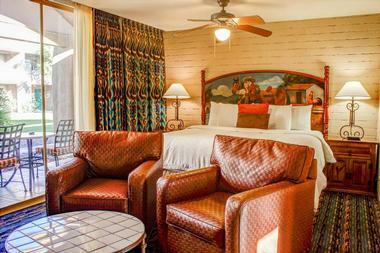 All guestrooms have patios and views of the corral, the cactus gardens, or the mountains. Ranch amenities include a recreation room and theater, a pool and hot tub, sports courts, fitness center, petting zoo, bar, and gift shop. Hot breakfast, a lunch buffet, and a grilled dinner buffet are available depending upon which plans guests choose. There are numerous activities, including a rodeo. Travelers looking for a guest ranch experience will find it at Hacienda del Sol Ranch Resort. What began as a ranch school for wealthy girls – think Vanderbilt, Westinghouse, Campbell – in 1929 was redesigned into a guest ranch in 1944, drawing the likes of Katherine Hepburn, John Wayne, Spencer Tracy, and other Hollywood types. After major renovations, restorations, and additions between 1997 and 2015, it is the Sonoran jewel it is today. Guests can choose from historic rooms, suites, casitas, or new Catalina rooms. There is fine dining at The Grill and casual fare at Terraza Garden Patio & Lounge. Amenities include a spa, pool and hot tub, fitness room, and gift shop. Guests can ride horseback, explore the desert, and enjoy the botanical gardens. 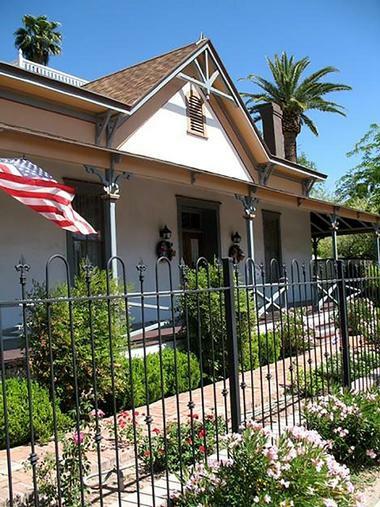 The Royal Elizabeth Bed & Breakfast Inn, affectionately known as The Liz, is a 19th century Victorian adobe mansion situated in the historic section of downtown Tucson. Five oversized guest rooms and suites have a bold Victorian décor and feature 17-foot ceilings and large windows. The Liz offers an impressive array of in-room amenities like period antique furnishings and upscale hi-tech gadgets and electronics. House amenities include a gourmet breakfast, pool and spa, satellite music inside and outdoors, and a parlor fireplace, among many others. 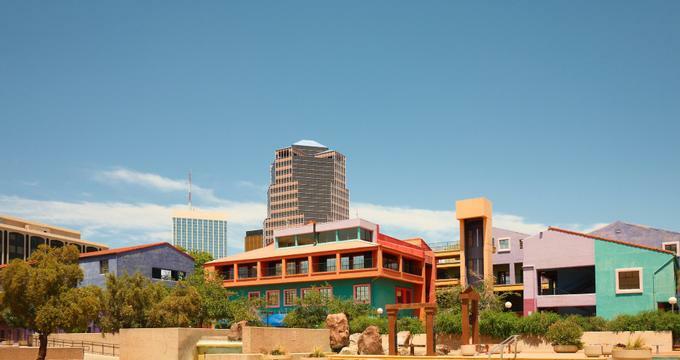 The inn is close to two of Tucson’s historic districts – the Presidio District and the Congress Street District – both of which expose visitors to the cultural heart of Tucson. Only a 10-minute walk from downtown Tucson, the Downtown Clifton is a unique low-rise 10-room motel with retro touches built in 1947. The rooms are colorful and bright, furnished with period dressers, chairs and nightstands, swag lamps, artworks by local artists, vintage highball glasses, and platform beds covered with traditional saddle-blanket bedspreads. Rooms also have flat-screen TVs, Wi-Fi, and minibars. Outside, a Día de los Muertos mural is a focal point next to a pleasant internal courtyard with chairs and a grill. The guests enjoy a record library, free coffee, a bike rack, and a dog run. The guests get a voucher for breakfast in the nearby diner. 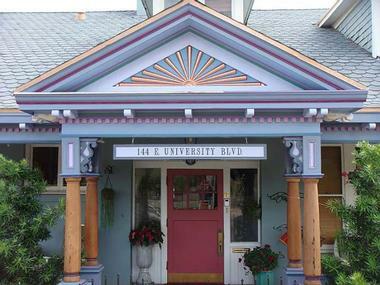 Peppertrees Bed & Breakfast is located in the heart of the downtown Historic District, just over a block from Main Gate Square near the University of Arizona. Main Gate Square and Fourth Avenue, also nearby, provide visitors with abundant choices for shopping, dining, and nightlife. Besides an unbeatable location, Peppertrees offers guests the ultimate in private accommodations. The main house serves as a welcome area, and is where breakfast is served. Five accommodations are in separate structures on the property. Sunrise and Sunset are two two-story, two-bedroom guest houses with private patios, living rooms, kitchens, and sitting areas. The Casita is a king suite in a separate building, and the East Wing House has two boutique-style queen suites. Accommodations don’t get any more personalized than at Paca de Paja Bed & Breakfast, where they only accept one set of guests at a time. This unique, eco-friendly B&B is a solar strawbale inn located in the desert near Kitt Peak Observatory. The colorful guest suite features Mexican décor with a queen-sized bed, antique accessories, hand-carved furnishings, and hand-woven rugs. There are tall windows to enjoy the surrounding desert landscape and an adjacent private bathroom. It also includes a private sitting room and a private porch. Nature lovers will enjoy birding, wildlife watching, mountain biking, hiking, star-gazing, and more. Hacienda Linda is as much artist’s retreat as bed and breakfast. The beauty of adjacent Saguaro National Park West has inspired a plethora of writers, painters, and photographers over the years. 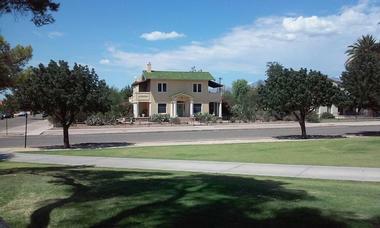 This inn sits on 6 acres of desert 30 minutes from downtown Tucson. There are two guestrooms that are on opposite ends of the inn. The king suite features a sitting area with fireplace, and there is a large soaking tub with mountain views in the en suite. The queen bedroom features an artistic décor, adjustable bed, en suite, and satellite TV. Both accommodations provide great park views, mini-fridges, and coffeemakers. 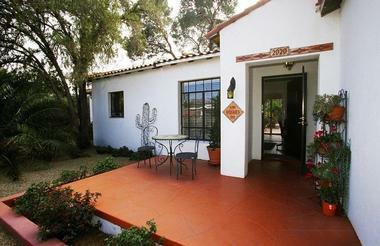 Casa de Caballo Bed & Breakfast is a casita situated on a working horse ranch. The casita features a Western décor that emphasizes horses. It has a sitting area, an en suite, and a kitchenette with full-size refrigerator, microwave, and toaster oven. There is a private patio with grill in front of the casita. Guests are also welcome to join the owners on their patio. 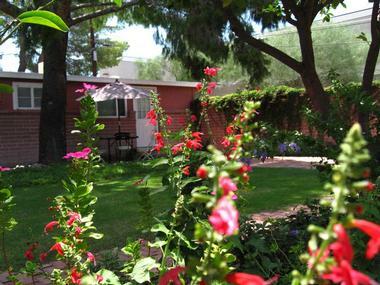 Located in the foothills of the Catalina Mountains, this B&B is 20 miles north of Tucson. Guests can participate in equine experiences with the owners and their horses. There are numerous outdoor activities available. The ambience of Casa Tierra was inspired by the haciendas of Mexico. The adobe home features numerous archways, Talavera tile floors, brick vaulted ceilings, and fountain courtyards. Guests can choose from three guestrooms or a two-bedroom suite. All accommodations have en suites, queen-sized beds, refrigerators, and microwaves. Each has a private patio with Mexican chimenea fireplace. Inn amenities include two landscaped fountain courtyards, game room/library, exercise room, outdoor desert hot tub, and use of the owner’s telescope to explore the night sky. Upon arrival, guests receive welcome fruit and snack baskets, chocolates, and iced tea, plus in-room fresh flowers. Mon Amí Bed and Breakfast is located in a quiet Tucson neighborhood with beautiful views of the Catalina Mountains. Guests can choose from two suites and a cottage. 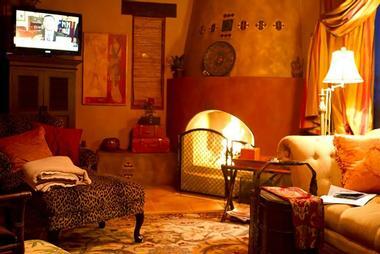 the La Vie En Rose Suite has a king bed, en suite, sitting area with a fireplace, and a private enclosed patio. The patio is surrounded by a shaded garden with mature trees. The French Country Suite has a queen bed, en suite, and separate sitting room with a futon. The Petite Cottage features a queen bed, full bed, and futon plus en suite. There is a separate sitting room and a kitchen. Stays include use of a pool and garden, and breakfast by an award-winning French chef. Architecture buffs, or simply those who appreciate the finer things of life, will fall in love with El Presidio Bed & Breakfast Inn, a Victorian adobe home with an Old Mexico ambience. 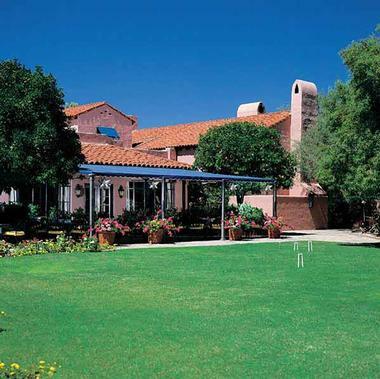 This elegant inn, situated in the El Presidio Historic District, has been featured in Bantam’s The Desert Southwest (American Design) and is listed in the National Register of Historic Places. Guests can stay in one of four guesthouses and suites. Garden courtyards, diverse mature trees, lush flora, fountains, cobblestone walkways, and a zaguan (central hall) with 17-foot-high ceilings characterize the property. A country-style hot breakfast is served in the Veranda Room, which overlooks a garden courtyard. At Sam Hughes Inn, guests stay in a Mediterranean-style home with four guestrooms. The inn is centrally located and features a patio, fountain, and sunken garden in a picturesque walled backyard with plenty of shade. Inside, the décor is a mix of modern and antique Southwestern style. The Tombstone is a wood-paneled room with a queen-sized bed and Old West décor. The Santa Fe is larger with a queen-sized bed and a twin bed styled in a Southwest design. The Nogales has a queen bed and Mexican décor, and the Pima has a Native American ambience and sleeps one. Breakfast is nothing fancy, but tasty. The inn accepts no kids under 11. Catalina Park Inn Bed & Breakfast has been serving visitors to Tucson for a quarter of a century and they have hospitality dialed in. This tasteful inn is close to both Historic Fourth Avenue and to Congress Street District – culinary, shopping, and entertainment hubs. 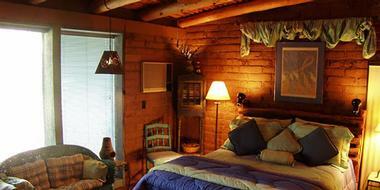 Rooms at the inn are self-described sanctuaries of privacy with four in the main house and two in a back courtyard. They are well appointed, individually styled, and have similar amenities. Breakfasts are classic dishes with the owner’s freshly baked Famous Banana Bread and plenty of European-roast coffee. Those with early departures or who are heading out for a day of exploration can request continental breakfasts to-go. The inn is closed during summers. Travelers who thrive on sophistication will want to book their stay at Westward Look Wyndham Grand Resort and Spa. This upscale retreat in the Sonoran Desert is a 1912 hacienda-style home turned 80-acre resort. There are 200 suites and 41 rooms with balconies and epic views of the desert landscape, mountains, or cityscape. Sonora Spa offers guests a variety of treatments with an emphasis on natural desert botanicals. There are eight championship synthetic surface tennis courts, three pools – a lap pool and two resort-style pools – and a fitness center. Guests can also explore four gardens, including a labyrinth, and take a Western horseback ride across the property. For the sports loving traveler, the Lodge at Ventana Canyon is a dream. As one of the top tennis hotels in the world, the Lodge at Ventana Canyon offers a variety of unique tennis programs, including a relaxing corporate tennis retreat program and a family program for all ages. The resort also features an eight-lane junior Olympic-sized competitive pool for swimmers. Visitors can relax after a day of sports with a poolside cocktail or a dip in the outdoor hot tub. Rooms are decorated in a Southwest color scheme. Many of the rooms feature views of the Santa Catalina Mountains. Made up of charming casita-style suites, the Arizona Inn, located in the peaceful neighborhood of Midtown, is a historic hotel with an unbeatable number of amenities. With complimentary Wi-Fi, clay tennis courts, and reliable babysitting services, the inn is the perfect place for vacationing families. Whether visitors are coming for business or celebrating a wedding in the ballroom, the Arizona Inn has accommodations for everyone. Couples can also enjoy their time here. At night, a piano player serenades patrons. During the day, guests can be found enjoying croquet or taking a ride on complimentary use bicycles. For visitors who want to have a thrilling time gambling in the comfort of their own hotel, the Casino Del Sol offers top-of-the-line slots, table games, and even poker. The AVA Amphitheater is a grand in-house outdoor music venue with six relaxing lounges. The casino also caters to business travelers. During the day, professionals can use the resort’s meeting and conference room. At night, visitors can relax at the casino’s Tequila Factory restaurant, which features over 100 varieties of the beloved liquor. Hungry guests can also enjoy the casino’s array of restaurants, including a steakhouse and a deli. Travelers looking for a country club setting will find it at the Hilton El Conquistador Golf & Tennis Resort. With three golf courses, six pools, and lit-up tennis courts, this resort is the perfect destination for active families who want to play. Visitors who want to improve their golf game are in luck; the resort employs professional PGA instructors in the practice areas. Outdoorsy types will appreciate staying only 2 miles from Catalina State Park. The resort also has a busy events calendar, offering yoga, Zumba, and meditation classes. For business travelers, El Conquistador offers a 24-hour business center, meeting rooms, and event space for up to 250 participants. 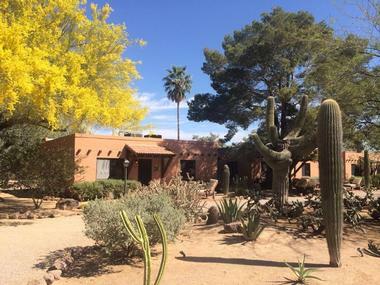 The Lodge on the Desert is well known for its unique architectural style and brilliant colors. This urban landmark has been hosting distinguished guests since the stars of 1930s Hollywood Westerns stayed here while shooting movies. Today, 100 hacienda-style rooms make the boutique hotel an especially romantic stay for couples, but hotel amenities attract families and business travelers as well. 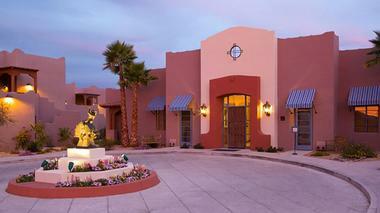 Rooms, suites, and casitas have a sophisticated Old Pueblo design and come in seven layouts. Room amenities include plush beds, kiva fireplaces, and complimentary Sonoran breakfast and Wi-Fi. The Cielos restaurant offers contemporary seasonal cuisine and live music by a classical guitarist on weekend nights. Travelers who appreciate the restoration of an 1889 Victorian Queen Anne home with meticulous attention to detail will fall in love with The Big Blue House Tucson Boutique Inn. This historic inn has seven rooms in the main house and a cottage available for extended stays. Guests can choose their ambience with the Asian-inspired Zen Room, world traveler Hemingway Room, east facing Morning Room, vintage Two-Room Suite, antique-inspired Uncle Duke’s Room, and modern Elegant Deco Room. Breakfast features down-home-style cooking with freshly baked scones and coffee cake and local gourmet coffee. The inn is within walking distance of downtown and two blocks from the historic Fourth Avenue shopping area. 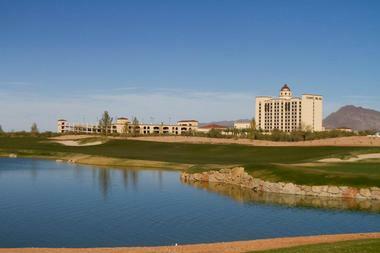 Families who want to enjoy the beautiful Arizona natural landscape consider Omni Tucson National Resort the ideal option. With spacious, comfortable rooms, the resort is a great place to enjoy quality time with family in a cozy setting. The diverse topography surrounding the resort makes it the perfect option for those wanting to go on a bike ride or hike through the terrain. Birdwatching and stargazing are just some of the fun activities that the resort hosts. Whether guests want to unwind with a massage, play a round on the golf course, or take in the view from a poolside cabana, the resort has something for every member of the family. The exceptionally charming La Posada Lodge & Casitas is an ideal place for business and pleasure travelers alike. The unique setting is perfect for a wedding reception or business meeting. The La Posada Lodge & Casitas also makes planning a large event a breeze with their individualized packages. For guests who choose the wedding package, the lodge provides a complimentary bridal suite with romantic touches, like champagne and chocolate-dipped strawberries. For office meetings, a boardroom and ballroom decorated in a Southwestern style make meetings feel more intimate. The lodge is also pet friendly, with some restrictions. The SunCatcher Fine Country Inn is a luxury desert estate near the trailheads of Saguaro National Park. Guests will revel in the panoramic views of the Rincon, Tucson, and Santa Catalina Mountains from different points on the property. 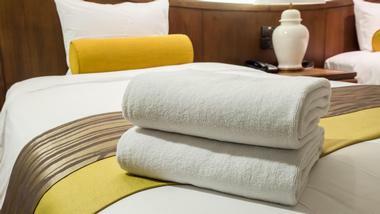 Four well-appointed guest rooms have private entrances, king or queen beds, satellite TV, Wi-Fi, and other upscale room amenities. Room décor is inspired by four themes – tranquil desert, romantic Old West, Colonial charm, and exotic Asian. This luxury gated estate also includes gourmet breakfasts, a pool and spa, a colorful desert garden, equestrian facilities that include an Olympic-sized riding arena, and a private zoo.